What Is VA Form 26-8937? VA Form 26-8937, Verification of VA Benefits is a document used to provide proof of veteran disability compensation or a non-service connected pension. Additionally, it helps to show whether the veteran has been rated by the Department of Veterans Affairs (VA) as incompetent. Lenders must ask VA loan applicants to fill out VA 26-8937 Form so that it can be submitted to the VA prior to loan underwriting - a process of a lender determining if a veteran's loan application is an acceptable risk. Has filed a claim for VA disability benefits before discharging from active duty service. 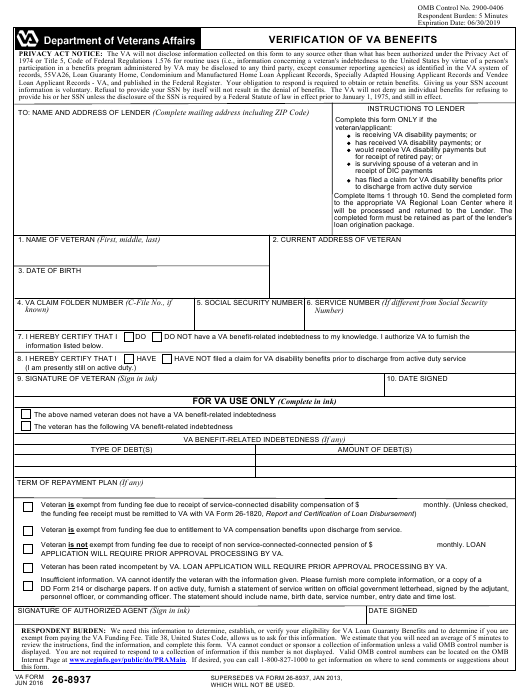 The form was last released by the VA in June 2016, with all previous editions obsolete. An up-to-date version of the form is available for download below. It is possible to file VA Form 26-8937 electronically and to submit it through the VA website. Is Va Form 26-8937 Still Required? How To Fill Out Va Form 26-8937? provide his or her SSN unless the disclosure of the SSN is required by a Federal Statute of law in effect prior to January 1, 1975, and still in effect. Veteran is exempt from funding fee due to entitlement to VA compensation benefits upon discharge from service. APPLICATION WILL REQUIRE PRIOR APPROVAL PROCESSING BY VA. Veteran has been rated incompetent by VA. LOAN APPLICATION WILL REQUIRE PRIOR APPROVAL PROCESSING BY VA.
personnel officer, or commanding officer. The statement should include name, birth date, service number, entry date and time lost. There is a specific procedure used by the lender to verify the veteran's exemption from paying the VA loan funding fee. In September 2011 this procedure has been altered and simplified for many veterans by the VA's decision to include the information regarding VA loan funding fee exempt status on the Certificate of Eligibility. The funding fee status is shown on the COE, so generally, lenders will no longer require the VA 26-8937. Repayment plans for any of VA debts are delayed. Certify that they have or have not filed a claim for VA disability benefits prior to discharge from active duty service. The completed form must be sent to the VA Regional Loan Center where it will be processed and returned to the lender. If the identification of the veteran with the information given is impossible.